Good: Big hit potential, Tons of great multi-colored patch cards, Sharp card design. Bad: As with any 1 pack per box product, it is a roll of the dice whether you strike gold or come up short. The Bottom Line: 2011 Topps Inception Football is my pick for product of the year - though there is still a months left for it to be unseated by a late season contender. It's sleek, modern, and packs a great punch without putting a whole in the wallet. 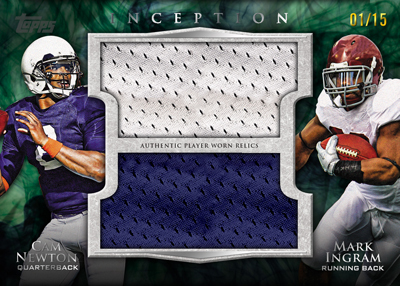 Topps Inception is everything that Ultimate Collection Football used to be and more. Two Upper Deck products came to mind while I was reviewing this product – Ultimate Collection and Upper Deck Black. The former because of its similarity to 2011 Topps Inception in terms of price point and product configuration, and the latter because of the similarities in design. My favorite set design of all time is Upper Deck Black, so suffice to say that Inception's design really jumped out at me. The design incorporates a refined, eloquent foreground with a simplistic by modern looking background to create some truly great looking cards. The only downside of the design is that its black background means corner and edge wear sticks out. But I can personally live with that and none of the cards from my review box showed signs of chipping or corner wear. This is definitely a rookie-focused product. It's main draw is its selection of high dollar rookie card jersey patches, autographs, letter patches, and autographed patches. 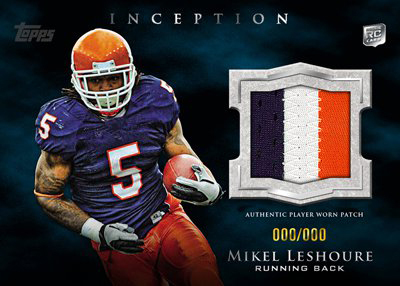 Topps Inception probably has more multi-color jersey patch cards then any other Topps product that I've broken this year. I typically consider 1 pack products in this price range to be extremely hit or miss. 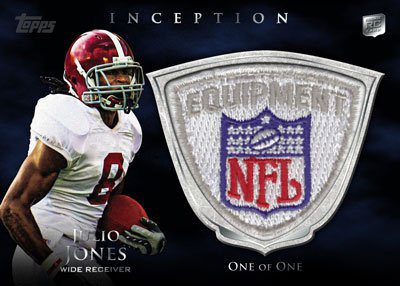 While there is certainly an element of that present in 2011 Topps Inception Football, there is lots of value to help minimize the risk of it being a miss. Instead of pinning the entire box's potential on the shoulders of 1 hit, it guarantees a generous 3 hits per hobby box. Inception also sports a larger-then-normal assortment of base cards – and thanks to its excellent design, the base cards are actually worth having. This was the most fun I've had with a box break in quite a while. I honestly didn't have any strong expectations regarding Inception, so didn't know what to expect. Maybe this contributed to me giving it such a high review rating. I don't want to build it out to be some miracle product that guarantees Cam Newton 1 of 1 autographs in each box, because it isn't. But what it is – a thoroughly enjoyable football card experience – is reason enough to give this product a shot. This Summer, a freshman football card offering known as 2011 Topps Inception ventures into uncharted waters. 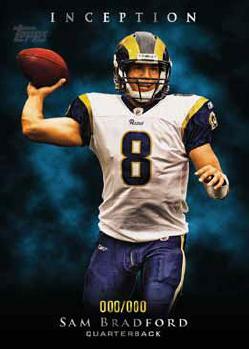 Those uncharted waters - the world of high-end preseason football cards. Each single pack box of Topps Inception will deliver 3 hits, 2 parallels and 2 additional cards. 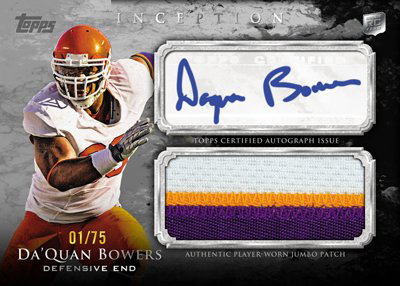 Rookie on-patch, on-letter and on-laundry tag Autographs! Every Autograph and Relic hit is a Rookie player! Featuring on-card Autographs on elegant 72-point stock! All images and relics will be NFL branded. Each 7-card Pack delivers - 2 Rookie Numbered On-Card Autographs or Rookie Autograph Jumbo Patch Card, 1 Numbered Rookie Jumbo Patch or Relic Card PLUS 2 Numbered Parallel Cards, 2 Striking Veteran Base Cards. 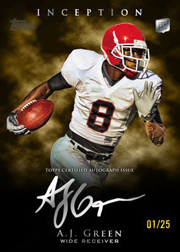 Rookie On-Card Autographed Base Cards - 35 NFL Rookie Premiere participants pen their names directly on their first high-end trading cards! Every card is numbered. Rookie On-Card Autographed Parallel Cards - Platinum: Numbered to 1/1, Red: Numbered to 25, Green: Numbered to 50, Grey: Numbered to 99, Blue: Numbered to 150. Rookie On-Card Quad Autographed Cards - Four Premiere Rookies team up and sign each of these book cards numbered to 5. Rookie On-Card Triple Autographed Cards - Three's not a crowd as 3 Rookies put pen to paper on cards numbered to 10. Rookie On-Card Dual Autographed Cards- Dynamic duos appear with each of their signatures numbered to 25. Rookie On-Card Autographed Silver Signings Cards - The same 35 Rookie Premiere players sign a black version of their cards with silver ink. Numbered to 25. Rookie Autographed On-Number Inception Patch Cards - The 35-player Rookie Premiere roster signs JUMBO-sized number patch swatches from their jerseys. Each card is ONE OF ONE. Rookie Autographed On-Letter Patch Cards - This time the rookies sign the letter nameplates from their jersey backs. Each signed letter is affixed to ONE OF ONE cards. Rookie Autographed On-Laundry Tag Cards - Last but not least each rookie signs his ONE OF ONE jersey laundry tag. Rookie Autograph Jumbo Patches - Each rookie featured with his autograph and JUMBO-sized multi-hued patch on numbered cards. Rookie Jumbo Relic Cards - Each of the draftees with a JUMBO relic piece and numbered. Rookie Patch Cards - A player along with a multi-color patch on cards numbered. Rookie Jumbo Relic and Patch Parallel Cards - Platinum: ONE OF ONE, Red: Numbered to 10, Green: Numbered to 25, Grey: Numbered to 75. Rookie Jumbo Patch Cards - The entire class again with a JUMBO patch displaying multiple colors on each of these numbered to 15 cards. Available in a ONE OF ONE Platinum parallel. Rookie Jumbo Team Patch Cards - Each of these cards flaunts a JUMBO team logo jersey patch representing the rookie's new team. Numbered to 4. Rookie NFL Equipment Logo Patch Cards - One of one cards brandishing the NFL Equipment patch from each player's jersey collar. Topps goes where no high-end product has gone before, into the world of mid-summer football cards! Dual Rookie Jumbo Relic Cards - “Two for one" as 2 rookies appear with 2 JUMBO relics on one card. Quad Rookie Patch Cards - A rookie quartet and four patch swatches are presented on numbered to 15 cards. Base Cards (2 per pack) - 100 Veterans suit up for the season on uniquely designed 72 point stock cards. Parallel Cards (2 per pack) - Platinum: 1/1, Framed Printing Plates: ONE OF ONE, Red: Numbered to 25, Green: Numbered to 50, Grey: Numbered to 79, Blue: Numbered. Early autograph checklist includes: Cam Newton, A.J. Green, Mark Ingram, Julio Jones, Da'Quan Bowers, Mikel Leshoure, Blaine Gabbert and Jake Locker.